POKHARA, June 14: Nepal Rastra Bank (NRB) has suspected that fake banknotes are being circulated among people in rural areas as people in urban areas can easily identify such notes. Officials of the central banks say that fake banknotes are arriving in the market through people in remote areas. Though circulation of fake notes has decreased in Pokhara, it is increasing in surrounding districts, say Thapa. Fake banknote of Rs 500 denomination was first found in Pokhara in the last week of January. NRB says that fake note of Rs 1,000 denomination has also been found in the market. “We are getting fake banknotes in the interval of two-three days. We have seized 150 units of such notes in Pokhara alone so far,” Thapa added. He further added that locals in rural areas will suffer if security agencies failed to bust the fake banknote racket soon. “We don't know who is distributing fake banknotes. But the fact is that fake notes are still in circulation. If not controlled in time, it can affect our economy,” he added. According to Thapa, some fake notes have also entered the banking system. “It is not people's fault. It is the weakness on the part of the banks,” he added. “As notes circulate in the market through the banking channel, both general public and financial institutions need to be alert,” he added. 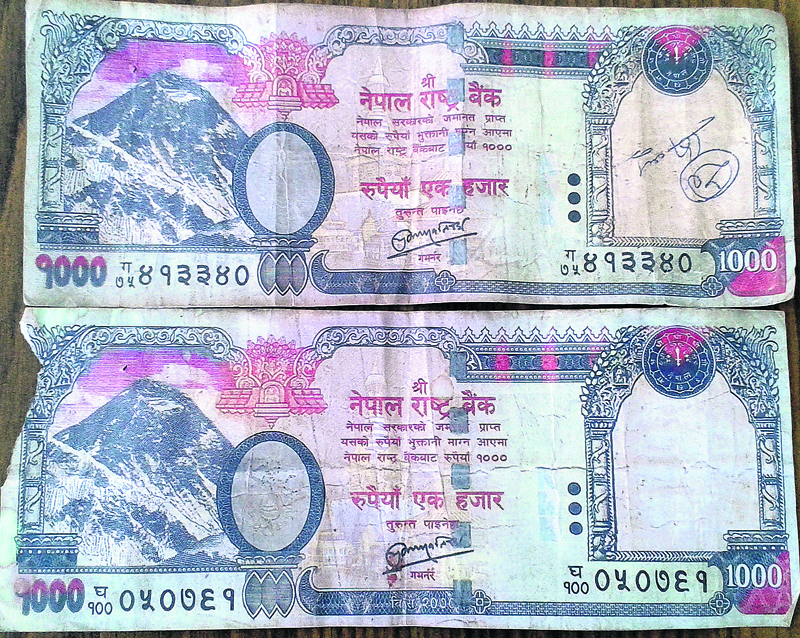 The fake notes do not have rhododendron watermark, according to Thapa. “All branch offices of banks should have UV fake note detector machines,” he added. Bishwa Mohan Adhikary, CEO of Om Development Bank, said fake notes must have entered the market from rural areas. “As it is difficult to circulate fake note in Pokhara due to increased financial literacy, the racket might have been operating from rural areas,” he added.